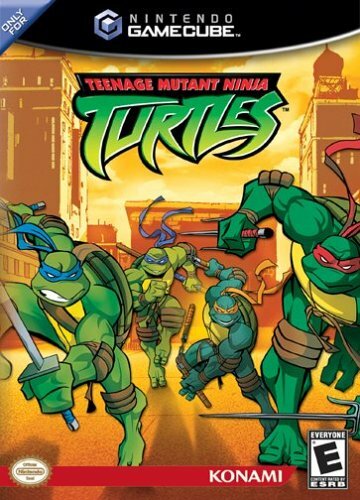 I couldn't believe how boring this Teenage Mutant Ninja Turtles game actually was. The game play may look similar to the old arcade game, but somehow the developers managed to make it feel just so extremely repetitive. I think this may have to do a lot with how the Turtles actually move. Hitting the primary attack button causes not only your character to attack, but to also step forward, and hitting it several times in a row causes combo attacks to execute. Thanks developers, because things like moving the joystick and pressing a secondary button is just too hard of concept for me to comprehend. This game is like Beat-em-up's for Dummies. So basically, except for the bosses, there is very little strategy here. You'll get very used to repeatedly pressing the attack button while twirling the joystick in a circle. The jump, including the jump attack, is pretty much useless for battling purposes, as is the uppercut, which takes slightly longer to execute than a normal attack and doesn't seem to do much more damage. Now, the throwing knives could be potentially useful, that is if you could get your character facing exactly the right direction before throwing them. I guess the developers never heard of an auto-targeting system. The other aspect of this game that makes it feel so repetitive is the battle cries. Each turtle has a surprisingly few number of different battle cries, but the real problem comes from the fact that they are yelled during every single attack! A lot of times they don't even have a chance to finish saying their current battle cry before starting yet another one. After the first stage you'll be wanting to turn the audio off completely. Hey developers, there happens to be this fairly well-known word called "moderation"... you may want to try looking it up. On the positive side, the graphics do look really nice, and all the audio does sound good. It seems like they got all the actors from the new series to do the voices. There are some cut scenes that look just like the new animated series, and those are done real well. Unfortunately, there are also cut-scenes using the in-game 3D engine, and those aren't done so well. They tend to zoom in on the character models, which don't look all that great up close. And then when they speak, their mouths don't even move. They just have a box pop up at the bottom of the screen with the text version of the spoken dialog and a little pic of the turtle who is talking. It's quite comical...unintentionally comical. My wife and I have been playing this game a little recently, but only because we've pretty much finished all our other two-player cooperative games. All in all, there are much better enemy-slaughtering games out there, such as The Lord of the Rings: The Two Towers, so I'd recommend staying away from this one. If you do still have the urge to buy it, just make sure you rent it first so you know what you're getting yourself into.